“If we could get rid of feed grounds and reduce population, we could solve much of our brucellosis problem,” Tom Roffe said. Not yet. But in the battle of host and parasite, it will adapt if given enough opportunity. The window of preventing an elk-adapted strain is now and if it is not closed then you will almost certainly find a strain of bacteria that can be maintained in the elk population. And if that happens, it does no one any good, not the rancher, the hunter or the outfitter. And, with CWD in the wings, there may be a variety of other diseases that will crop up over time if such concentrations of animals are maintained. I’m fairly confident no one in Montana, or elsewhere for that matter, wants to comment on the fact that Roffe clearly states in the article how the elk population needs to be brought down? I guess the wolves aren’t quite decimating the herds quite like everyone claims?!? The high number of elk as claimed by ranchers always contradicts the SFW and Gov Dave’s own claims that the elk have been decimated by wolves. Even Game and Fish reports contradict the highly politicized Game and Fish Commission here in Wyoming. Tom Roffe said: “Off of feeding grounds, the risk for elk contracting and carrying brucellosis exists, but at a “very, very low prevalence.” “In elk, it is a marked difference between what we see in elk on feeding grounds and off feeding grounds,” he said. This used to be true. It’s not so black and white anymore, with prevalences in elk in Wyoming pretty far away from established feedgrounds significantly higher than previously recorded, and the cause or causes are not worked out thoroughly (although some common sense guesses might not be far off the mark, such as “feeding” that does not involve traditional feedgrounds, concentration of elk on private lands with no access by hunters, predators, or scavengers, and possibly migration/dispersal of elk from hot zones). I’d say if Tom is so enchanted with the idea of immediate and abrupt closing of feedgrounds, start at home and show some good faith by stopping feeding on the National Elk Refuge this coming winter. The political and biological chaos and fallout will be…well…interesting. It would be a very insightful test case and probably an example of the best and certainly worst outcomes imaginable (due to the size of the premise, number of elk – and bison – fed, and location smack dab in the middle of developed and highly accessible Jackson Hole). Regarding an “elk-adapted” strain – that’s not really how the disease works. The current field strains in the GYA seem pretty damned well adapted to elk – it’s more about the epidemiology of the disease and transmission events and risks that perpetuate brucellosis in the GYA, not specific host/agent adaptations. Break or lessen the transmission cycle and risky events (abortions in concentrated animals particularly) and prevalence should fall naturally. 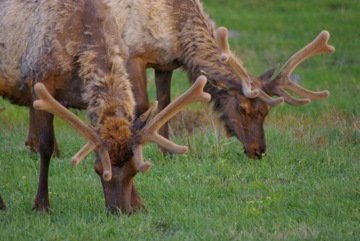 Even infected elk that carry the bacterium are not significant transmission risks if they abort or calve in isolation (natural winter range or summer calving grounds) – reducing elk concentration significantly reduces the number of in-contact animals, including naive animals susceptible to infection that will perpetuate the cycle in their first post-infection pregnancy. It only makes sense there would be a problem with brucellosis in these artificial concentrations. Think how bad it will be if chronic wasting disease makes its way into any of these areas. No amount of wolves will cause that much devastation. I understand that the brucellosis seroprevalence in the Clark’s Fork Herd has suddenly spiked.